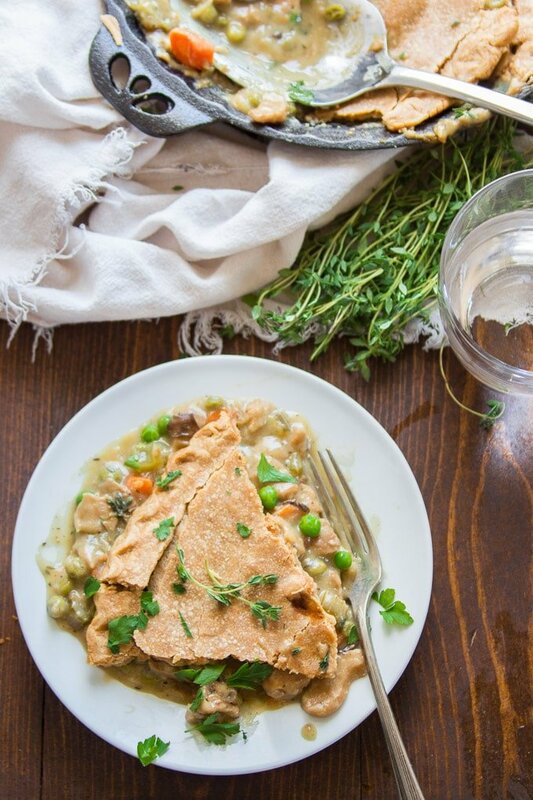 The idea of making a vegan chicken pot pie took a little while for me to warm up to. 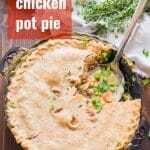 I think I only actually ate chicken pot pie once when I was kid, and I guess I wasn’t that impressed, because I did give up meat and all by the time I was thirteen. Finally, after six years of blogging, I decided to give it a go. And I think I did a damn fine job! 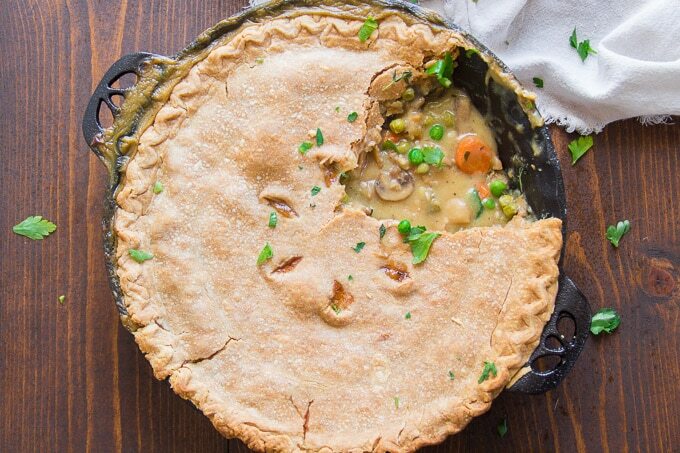 Veggies, herbs, creamy gravy and vegan chicken, in the form of mushrooms + seitan, all baked up under a flaky crust go into this pot pie, which, my husband tells me actually tastes better than the pot pies he used to eat before giving up meat. It all starts with the filling, and the filling starts with mushrooms. The mushrooms should be sautéed by themselves in a bit of oil. 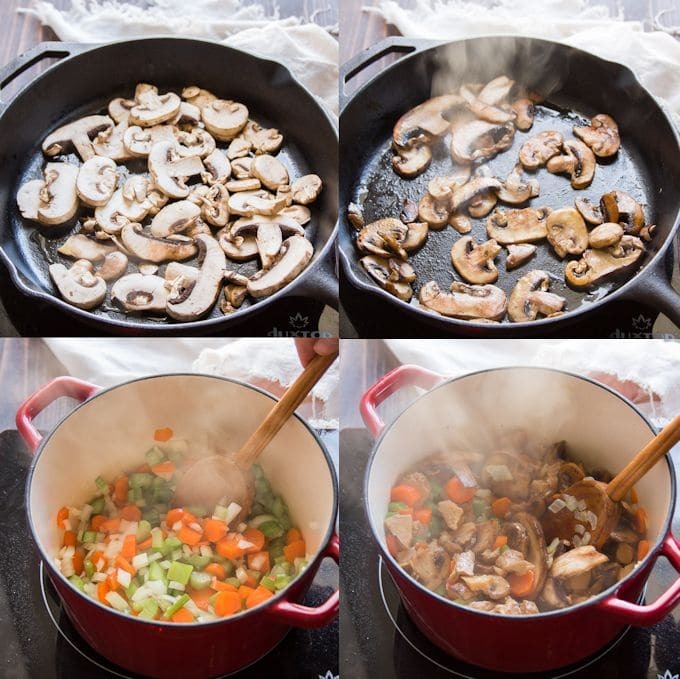 You can either do this in a separate skillet, allowing them to cook while you get started on the veggies, or you can cook your mushrooms first and then remove them from the pot before you start your veggies. Save dishes or save time — it’s up to you! Next sweat some onions, carrots and celery in a pot with a bit of oil. Once they begin to soften up, add some garlic, then add you seitan and return the mushrooms to the pot. Sprinkle in some flour. This is your thickener. Make sure to add it slowly and stir everything in the pot to distribute the flour. Give it a minute to cook, and then add some white wine. 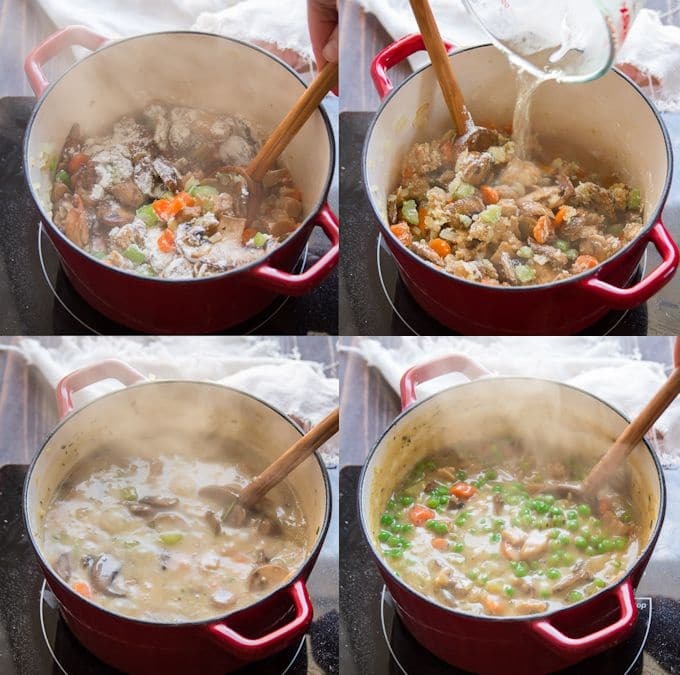 Bring the wine to a simmer — it should thicken up very quickly and coat the veggies. Let it cook just a bit to reduce, then add your broth, non-dairy milk, herbs, and seasonings. Let everything simmer until the veggies are soft, and then stir in some thawed out frozen peas. Ladle the filling into a large pie dish or casserole dish. Arrange a pie crust on top and pinch it around the edges of the dish to form a seal, then cut some slits in the top for ventilation. Bake the pie until your crust is golden. You’ll probably see some filling bubbling up around the edges by the time it’s done! Not a fan of mushrooms? Feel free to substitute extra seitan. Don’t like seitan? Leave it out and use extra mushrooms. Use your favorite pie crust for this recipe. I love my coconut oil pie crust, made using refined coconut oil (so you don’t taste the coconut) for this, but you can also use a store-bought crust if you prefer — just check the ingredients to ensure it’s vegan! 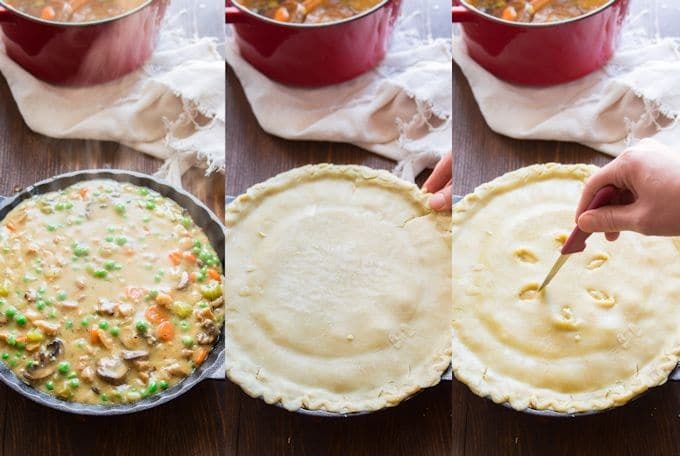 Make ahead option: Prepare the filling up to two days in advance, then assemble and bake the pie on the day of serving. Double crust option: Feel free to place a layer of crust on the bottom of the dish as well as the top. Just ensure that you’ve got enough room in your dish. I recommend using a 2 quart (9 x 9 inch) casserole dish for a double crust. I used a deep 10-inch pie plate for the pie shown in the photos, and had just enough room for everything. If your pie is a tight squeeze like mine, make sure to place something under it, like a cookie sheet, during baking. There will be drips! This vegan chicken pot pie is made with tender veggies simmered in savory herbed sauce and baked up under a flaky pastry crust! Coat the bottom of a large pot with 2 tablespoons of oil and place it over medium heat. When the oil is hot, add the mushrooms in an even layer and cook them for about 5 minutes, until browned on the bottoms. Flip and cook for about 5 minutes more. Add the remaining tablespoon of oil to the pot, and give it a minute to heat up. Add the onion, carrot, celery and garlic. Cook for about 10 minutes, flipping occasionally with a spatula, just until the veggies begin to soften and onions become translucent. Return the mushrooms to the pot and add seitan, along with any juice in the package. Sprinkle in the flour, a bit at a time, stirring frequently to form a thick paste that coats the veggies. Stir in the wine and bring it to a simmer. The liquid should thicken up very quickly. Allow it to cook for about a minute, stirring frequently. Stir in the broth, milk, nutritional yeast, soy sauce, rosemary, thyme and sage. Raise the heat and bring the mixture to a simmer. Lower the heat and allow the mixture to cook at a low simmer for about 15 minutes, stirring occasionally, until the veggies are tender and the sauce has thickened up a bit. Remove the pot from heat, taste test and season with salt and pepper to taste. Adjust any other seasonings as desired. Preheat the oven to 375° and gather a large (deep 10-inch diameter or larger) pie dish or a 2 quart casserole dish. Use a rolling pin to roll the pie crust so that it's large enough to fully cover the top of the dish. Transfer the vegetable stew into the dish, then drape crust overtop, trimming any low hanging edges. Cut a few slits in the top of dough. Bake until crust is golden brown and the filling is bubbly, about 40 minutes. Remove from oven and allow to sit for about 5 minutes before serving. If you don't like seitan, leave it out and double the mushrooms. If you don't like mushrooms, leave them out (skip steps 1-3 of the recipe) and double the seitan. I can’t wait to try this! Thank you! One question though – what is a good white wine substitute to avoid using alcohol? Hi Brandy! You could just substitute with extra vegetable broth – it might need a bit more time to thicken up fully. I hope you enjoy it! It would really depend on what type of crust you go with. If you want to take that into account and figure out the nutrition info, this is a great tool to use. Just made this and it taste great!!! I didn’t make a crust. I made vegan biscuits to put on top and bake in a dish. I am also going to freeze this in individual portions with a biscuit on top of each one and see how it turns out. Will being using this recipe again , for sure !!! I’m so glad to hear it! And I love the idea of using biscuits as a topper. Thanks so much Frankie! We made this last night and OH MY GOD. 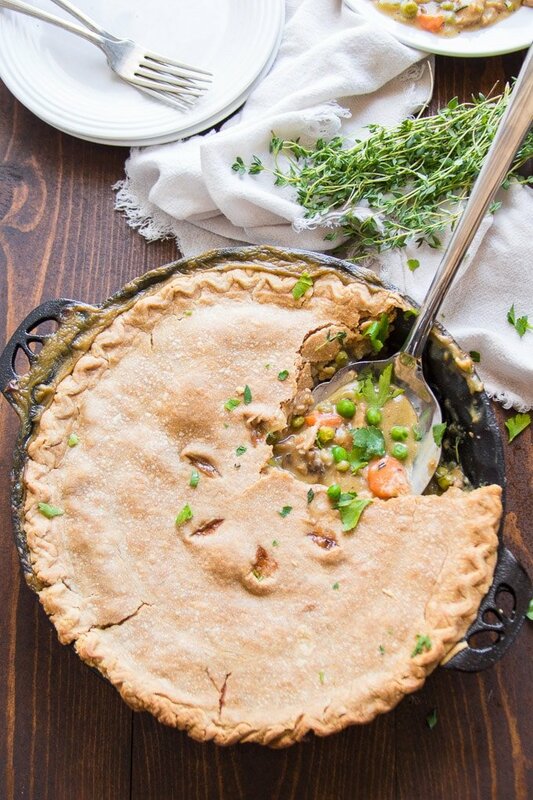 I have not had a good pot pie – vegan or before – in so long. This one blows all the other recipes I’ve tried out of the water! I bet it will be even better in the colder months. Just one thing, make sure the wine is also vegan as most of them are not! HI! I finally got around to trying this recipe and it turned out great. I used a regular old store bought crust and double mushrooms, and I realized too late I was out of peas so I used a can of green beans. It ended up having a slight green-bean-casserole vibe to it by accident. Every recipe of yours I’ve tried has been a hit! Oh, I bet green beans were awesome in this! I’m so glad you enjoyed it! Thank you so much Dianne!! Yup! Just double up on the pie crust, use half to line the bottom of the dish, and pinch the edges together tightly! I would recommend that. I think an additional 3 or 4 tablespoons of broth should do it! The crust might soften up a bit, but I always have leftovers when I make this and they’re great. Another option is to assemble the pie a day ahead and bake it when you’re ready. Enjoy!! I was skeptical about the liquid smoke but decided to have faith and girl, you are a genius! I could not stop eating it by the spoonful straight out of the pan! I ladeled it into 3 smaller pie dishes and covered them w/ cut out dough hearts 💕 for Valentines Day. Thanks Alissa! Yay! What an awesome Valentine’s Day meal! Thanks so much Mardy! I’ve made this 3 times since I discovered it a couple of months ago. It’s that good. The first time, I didn’t have any seitan so decided to give TVP rehydrated in vegetable broth a try. We loved it. The second time I made it with seitan and, though my husband thought it was okay, I really didn’t like the rubbery texture and we both preferred the TVP. So, recently, I went back to that and…yummm. I use my own whole wheat pie crust, only on top, as suggested, to save on calories but, overall, the calorie count on this isn’t bad. We think you’re a genius for figuring out how to create these wonderful, homey flavors. I have only one quibble…the 15 minute Prep Time is much too low as you can see just by looking at the recipe: cooking the mushrooms for 10 minutes, cooking the veggies for 10 minutes, simmering for another 10 minutes. I’m retired so have a lot of time to spend cooking so didn’t mind that this was a fairly labor intensive dish. For anyone who’s wondering, it is definitely worth whatever time it takes to make it (and, sorry, I can’t give you a more accurate time because I know I’m quite a bit slower than many cooks as I’m always trying to do too many other things while I’m cooking). Now, on to some of your other recipes…. This is almost identical to my own recipe for pot pie except I don’t use seitan and I also add 1/4 c nutritional yeast. My family Ioves it too! We also like a lot of your recipes. Great minds think alike! I’m glad you’re enjoying the recipes! Thanks Elizabeth! The recipe made loads! Although if I keep going back to the kitchen it will be a serving for one!! I double up on the mushrooms. Really enjoyed this one! Tomorrow’s hit Parade?!! The Chickpea Loaf. Yay! I’m so glad you like it! Thanks so much Jackie! !